I made this card for today's sketch saturday. I know I added a little bit too much dazzling diamonds glitter. But I guess it is ok. The card front is GP white, which I used the swiss dots cuttlebug embossing folder on. I adhered an older SU holiday designer paper to the bottom part of the card front, and a strip of figgy puddy by basic grey designer paper. The main image is by Penny Black. I think it is called "sledding". It was colored with blick studio markers which are similar to prismacolor markers. Happy Winter comes from a retired SU stamp set "happy winter". To finish this card off, I used punched out snowflakes and a little ribbon, and like I said added a little too much dazzling diamonds. (couldn't find my bottle of stickles), the card base is chocolate chip. No such thing as to much sparkle as far as I'm concerned :). Love the image you've used, very pretty!! Thank you for joining us this week at Sketch Saturday! Ellie, this is so sweet! Great job with the sketch! We had a little dusting of snow here in Maryland, and this little stamp makes me want more and time to go sled! You did an awesome job with the card!. Love the hedgies and your layout! very nice work!! 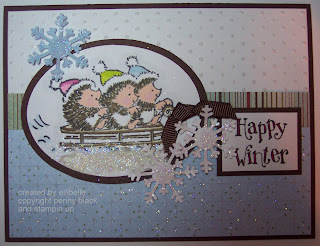 Wonderful card, those Hedgies are so cute. Great card, love all the sparkle and the image is so cute. I just love this cutie! Love that image!! I LOVE this! It is so adorable. Great job!